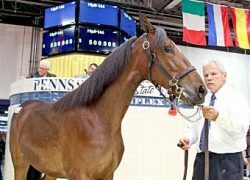 Fifty Cent Piece was acquired for $500,000 by Lennart Agren’s SRF Stables. USTA/Mark Hall photo. 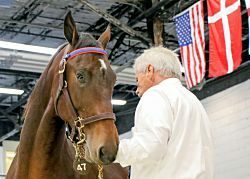 Swiss House Onfire, a trotting colt by Muscle Hill out of Brooklyn, was hammered down for $335,000. USTA/Mark Hall photo. 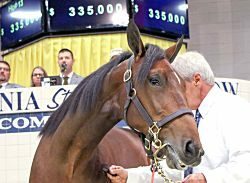 Trixton-sired trotting filly Krickan sold for $415,000 to John Floren’s Coyote Wynd Farms. USTA/Mark Hall photo. 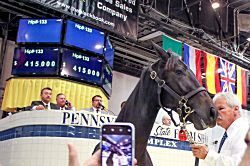 Captaintreacherous-sired pacing colt Honorat Hanover sold for $400,000 to Myron Bell as agent for the Captain’s Court ownership group. USTA/Mark Hall photo.